Originally, Maynard and me decided to skip this one (during the festival, he stayed at my apartment, so leaving together meant that we could split the cab fare) – especially since the festival had been rather disappointing and thus exhausting. But then came “The Pack”, and Maynard found himself wide awake and didn’t really feel like leaving. I was this close to go home anyway, but then I let them talk me into staying – something that I would ultimately regret, since 90 (more) minutes of sleep would have been vastly preferrable to this. 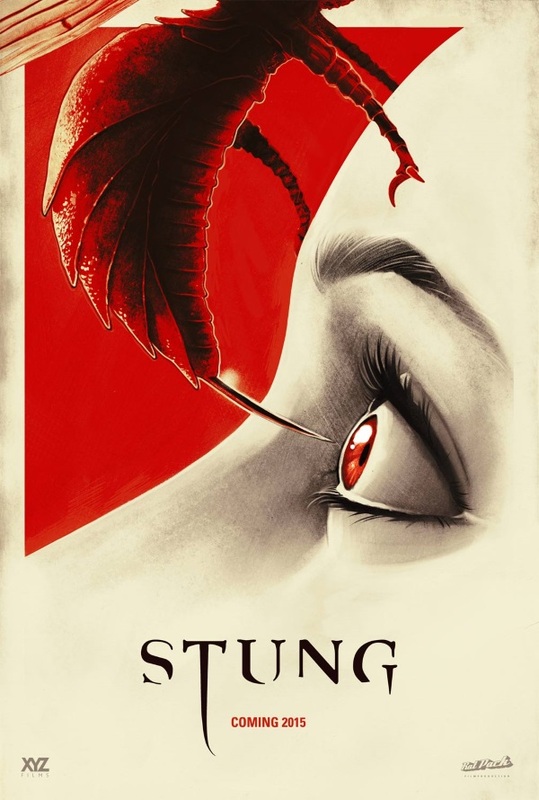 “Stung” wasn’t the self-aware trash fest that I hoped it to be. Instead of taking the “Sharknado”-route, they play it straight. Something that I could have admired if the movie itself would have supported it, but unfortunately, most of the time it seemed to me like Benni Diez didn’t really know what kind of movie he wanted to make – a silly trash fest or a serious creature feature – thus ultimately failing on both accounts. It’s biggest sin is how boring it all is. The entire movie is incredibly dull and totally unforgettable (there is exactly one memorable kill, the rest is run-of-the-mill stuff), the dialogue is bad (“To be a man, you have to be a man.”) but not sufficiently so to make the movie entertaining (intentionally or otherwise), the plot is painfully predictable (like the revelation of who is responsible for all this, as well as the question of who’s going to live and die), tonally it’s all over the place (funny one scene, serious the next), the romance didn’t work for me at all, the characters are completely uninteresting, the editing is absolutely terrible, with no flow to the scenes and no feel for tension or atmosphere (take Paul’s trip outside the house, which is intercut with what happens within, in a way that whenever there was any danger for the movie to actually become suspenseful for a second, they cut away and totally take us out of that moment), and a [SPOILERS! ]“Kingdom of the Spiders”[/SPOILERS]-like ending that wasn’t shocking or haunting, but rather unintentionally funny. Its only saving graces are Lance Henriksen (who actually plays a bigger part than I expected beforehand), the old-fashioned, practical creature effects, and – most of all – the nice role reversal during the showdown, where they inverted the typical “damsel in distress”-trope. Ultimately, though, this wasn’t enough to save the movie for me. As long as you’re not allergic, getting stung by a wasp is probably less painful and more enjoyable than watching this crap. This entry was posted in /slash, movie reviews, new releases and tagged /slash, /slash 2015, Adam Aresty, Benny Diez, Clifton Collins Jr., germany, horror, Jessica Cook, Lance Henriksen, Stung, Tony de Maeyer, trash. Bookmark the permalink.